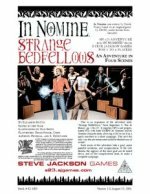 This introductory adventure for In Nomine (complete with GURPS In Nomine stats) puts a group of angels in almost as much danger from the bickering factions among themselves as it does from their demon foes . . . When an angel goes AWOL, his fellow followers of Michael want to find out what's wrong and bring him back – while the Servitors of Judgment just want to slap the cuffs on and bring him to angelic justice! Can the players keep the peace and solve the mystery? They can if they can overcome their differences and make Strange Bedfellows . . .